What are some of the little everyday things that bring you joy? With a continuous flow of scheduled commitments, unplanned situations, everyday routines and randomness, plus those inevitable kid-tasrophies, I need a drink. I need a continuous flow of coffee. For those like myself, busy days can be made better with a steaming cup of java joy. Yes, joy comes from standing in a ridiculously fragrant, aromatic coffee house to have that coffee served to us in a trendy cup, that is also not always a timely or thrifty option. Saving time and more importantly, money is not always an easy decision when sacrificing quality is the bottom line. The tought of settling for a cup of instant coffee can be a useful for a quick caffeine fix, however, the options are minimal, to say the least. Egoiste, is a new, premium brand of instant coffee transported from Europe, officially launching its distinguished brand in the United States, to "raise the caliber of instant coffee available". "Egoiste Café Noir brings bold flavor and delicious coffee when and where the consumer wants it." 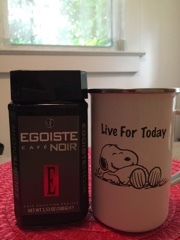 The fact that I can enjoy a cup of instant coffee that doesn't sacrifice taste and is ground from carefully selected beans that bring out of Egoiste Café Noir a uniquely, deliocious coffee aroma and flavor. Egoiste Café Noir instant coffee takes just a moment to dissolve a teaspoon or two into hot water and I wholeheartedly agree with Egoiste in stating that "no shortcuts were taken in its production". 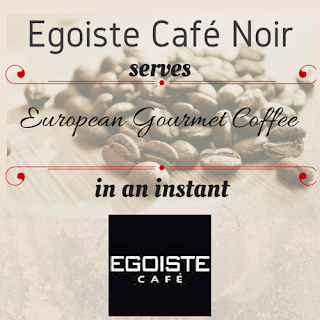 Produced in Germany and freeze-dried through a proprietary process, Egoiste Café Noir is made with a blend of highland and lowland Kenyan Arabica beans, making it the highest quality of coffee and measuring up to the strict European standards. Its distinguished mild taste and rich flavor comes from highland plantations while the lowland Arabica provides the fragrance. Egoiste Café Noir is sold online and on select online retailers. For U.S. purchasing information, please visit egoistecafe.co. I have received Egoiste Café Noir complimentary for the purpose of facilitating this review. As the owner of this blog, niecyisms and nestlings, I am compensated to provide my opinion on products, services, websites and various other topics. This blog may contain affiliate links. Even though, as the writer/owner of this blog receiving compensation for posts or advertisements, I will always give my honest opinions, findings, beliefs or experiences on those topics or products. This blog abides by word of mouth marketing standards. I believe in the honesty of relationship, opinion and identity. The views and opinions expressed on this blog are purely my own. Any product claim, statistic, quote or other representation about a product or service should be verified with the manufacturer, provider or party in question.